The BitFenix Prodigy Mini-ITX case has been out for a few months already, and though that might be a lifetime in tech time, the reviews keep coming. This time it’s the white version on the table, and although there is no fuctional difference between the white and black versions, it’s still refreshing to get such a thorough visual tour of the surprising sharp-looking white variant. White would be a bit too conspicuous for my tastes, but if you like that old-school Mac look, I suspect the white Prodigy won’t disappoint. Plus, the black version seems to have become as rare as hen’s teeth online lately. Hopefully this is a sign that BitFenix has struck a chord with consumers, and not just reviewers and custom builders on Ebay. 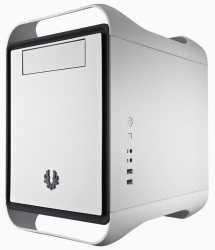 With the Prodigy, BitFenix has a compact, mini ITX compatible case in their portfolio, which is perfectly suitable to build a small but yet powerful system. Furhtermore this nice looking little case should also offer plenty of space in the interior.